Keeping the boat engine purring this month is a high priority as salmon runs are peaking in many places and other freshwater fishing opportunities are hitting a high note. This adrenaline “fishing” rush hits me every August as the window of hooking migratory salmon begins to feel like I’m chasing the caboose of steam train. With that said there are still many viable options from Puget Sound into the Strait of Juan de Fuca; on the coast and inner-waterways like Willapa Bay and all the way down to the Columbia River mouth. 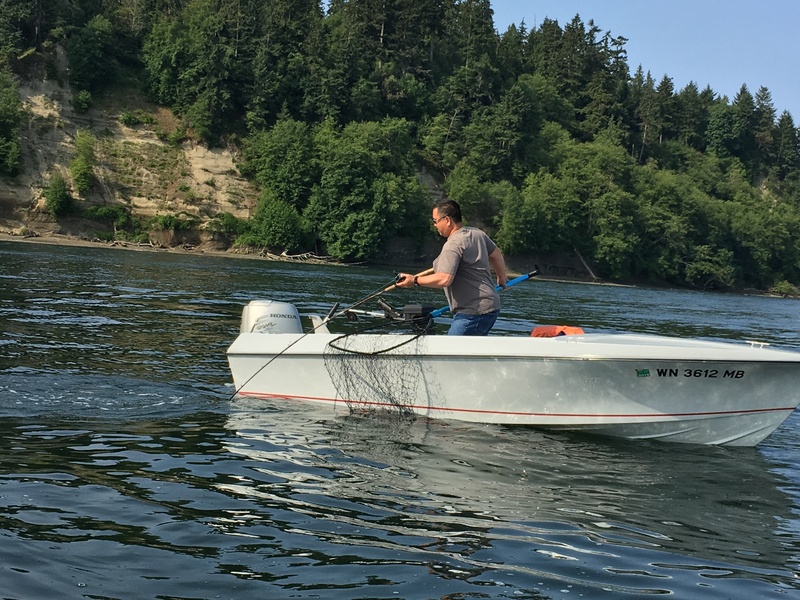 “We’re gobbling up the salmon quota really fast in the ocean, and I heard it was crazy good just outside the mouth of the Columbia at Ilwaco with some of the better fishing seen in recent years,” Said Larry Phillips, a WDFW fishery resource manager. 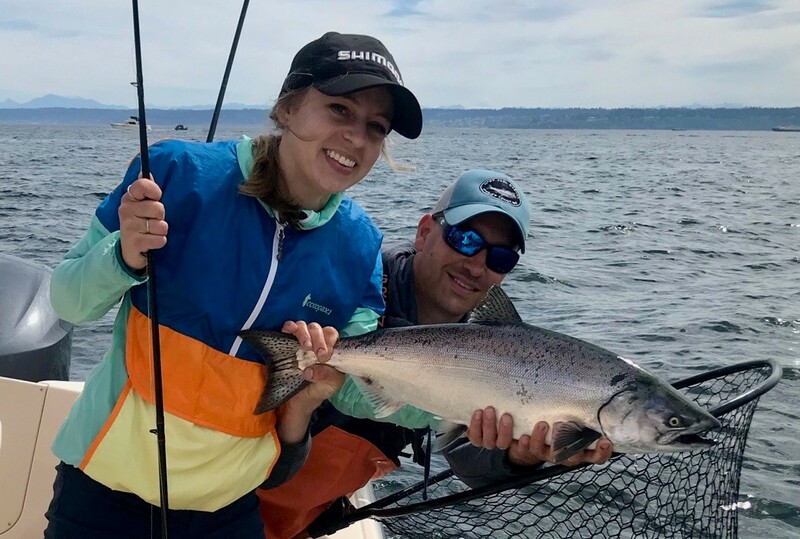 Early word since the Buoy 10 salmon opener on Aug. 1 at the mouth of Columbia River has been fair to good with a mix of kings and a few hatchery coho, and outside on the ocean hasn’t been too shabby although early tuna chasers have been struggling. Buoy 10 at just outside of Ilwaco along the buoy line and Long Beach are the gateway for feisty kings and coho staging before moving up the mighty river. Even though the salmon returns aren’t as glamorous compared to recent year averages – the total fall chinook forecast is 365,000, which is about half of the 10-year average and falls below the 582,600 forecast and actual return of 475,900 last year – it will still provide a bounty of hook-ups to make for a worthwhile trip to Ilwaco-Astoria area in the weeks ahead. Looking at the waters outside of the Columbia mouth be sure to make your way to the shallow water fishery off Long Beach. This is a rather easy place to fish as long as you stay clear the commercial crab pots. Try trolling in 20 to 50 feet of water with a six- to eight-ounce banana weight and whole herring tied to a mooching rig will get the job done. Be sure your boat is trolling at a fast clip of 3 to 3.5 miles per hour with 13 to 15 pulls of line off the reel. The huge schools of anchovies in the area will have your rod tip vibrating with excitement and watch those kings smash your bait and head out into the horizon like a fast-moving Porsche on steroids. Just inside the Columbia River is the famous Buoy 10 salmon fishery where on busy weekends the boats will stretch in all directions all the way up to the Astoria-Megler Bridge and beyond. Target salmon at places like the “Wing Walls” on the Washington side of the river, Desdemona Flats, above and below the Astoria-Megler Bridge and the Blind Channels just above the bridge. 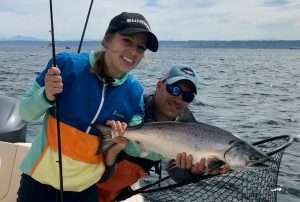 Moving into the Puget Sound region salmon anglers are seeing some of the best summer hatchery king action seen for quite some time. This likely stems from a South Puget Sound-bound hatchery chinook forecast of 227,420, which is up 21 percent from 10-year average and a 35 percent increase from 2017. Central Puget Sound continues to produce a stellar hatchery king bite off Kingston, Jefferson Head, Richmond Beach, West Point south of Shilshole Bay, Yeomalt Point, Point Monroe, Skiff Point, Blake Island off Allen Bank, Lincoln Park off West Seattle, Dolphin Point off Vashon Island and Southworth. For now, WDFW has decided to keep the hatchery chinook limit at one daily. Moving further south places like south-central Puget Sound has switched back to being open daily, and catches remain steady around the Tacoma area off the Clay Banks, Flats and even as far south as Fox Island and Anderson Island to Johnson Point. Other deep southern sound spots to look for hungry kings are Nisqually Flats, Dover Point near Zangle Cove, Itsami Ledge, Dickenson Point, and Little Fish Trap Bay and Big Fish Trap Bay. 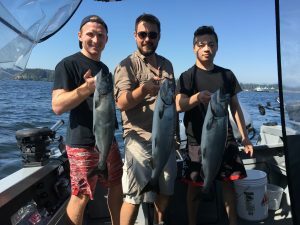 The Strait of Juan de Fuca continues to pump out a fair number of hatchery kings and coho at places like Sekiu, Freshwater Bay and Port Angeles. Another sleeper spot in late-summer is the San Juan Islands and is open to wild and hatchery kings through Sept. 3. 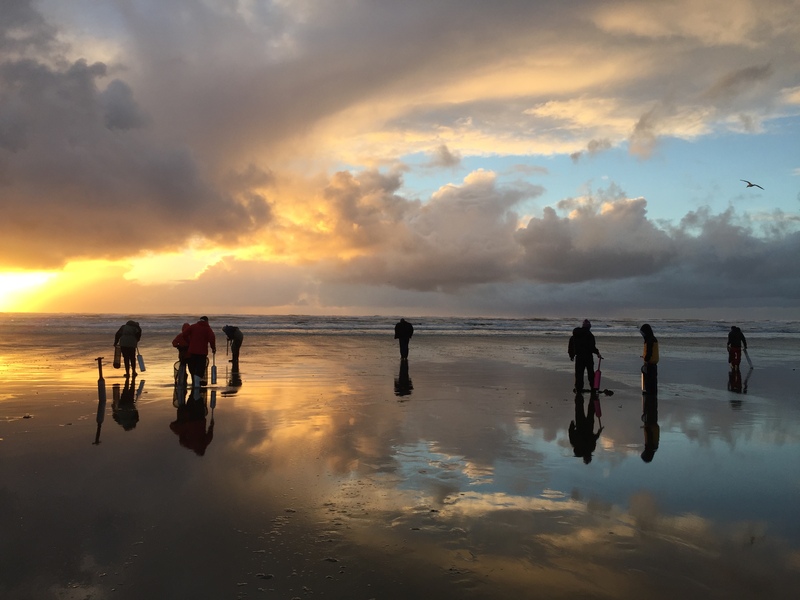 The summer razor clam population assessments are winding down and WDFW reports it will be a mixed bag of success depending on the beach you target in 2018-19. 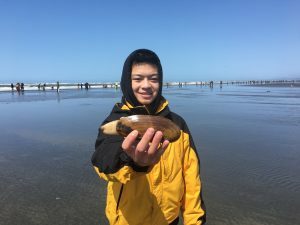 On the southern coast, Long Beach has seen a dramatic loss of razor clams – the lowest in 25 years – and will be faced with dismal success and might not be open until spring time. The likely culprit at Long Beach is freshwater run-off from the Columbia River especially along the southern-most tip. Preliminary postseason estimates coast-wide from 2017-18 for 27 digging days was 257,004 digger trips produced 2,731,461 razor clams for 10.6 clam per person average – the first 15 clams is a daily limit regardless of size or condition. Coast-wide clam digging was open from Oct. 6-7, Nov. 2-5, Dec. 1-4 and Dec. 31-Jan. 1. Digging didn’t reopen until Jan. 28-Feb. 3, March 2-3, March 16-17 and April 19-22. A marine toxin known as domoic acid – a natural toxin produced by certain types of marine algae – that can be harmful or even fatal if consumed in sufficient quantities has remained very low this summer. WDFW sets a cutoff of 20 parts-per-million (ppm), and all beaches have stayed in the vicinity of 1 to 2 ppm. Dates won’t be approved until sometime in September, but the best low tides are Oct. 26-29 and Nov. 8-10. Exactly how much digging time will occur depends on upcoming discussions between WDFW and tribal fishery co-managers. Digging time around the New Year’s holiday won’t happen due to unfavorable low tide conditions, but there are some good tides the weekend before Christmas. State Fish and Wildlife plans to have the public comment review period should ready by the middle of September, and information will be posted at http://wdfw.wa.gov/fishing/shellfish/razorclams/.